Ecologix clarifiers are designed for minimal footprint and rapid particle settling. 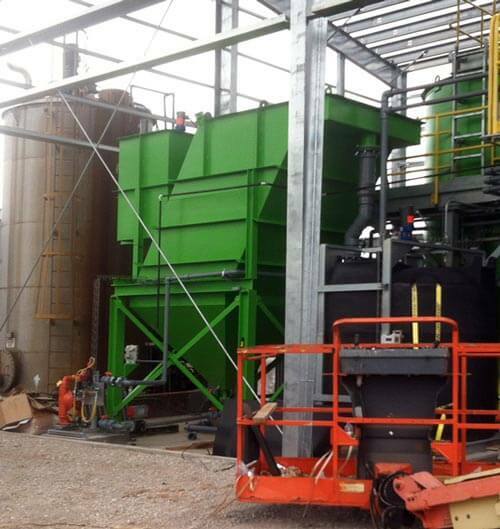 Our clarifiers are simple to operate and maintain, flexible in treatment capacity, and highly effective at removing solids in waste streams with pollutants that tend to sink. Systems can be skid-mounted as a stand-alone product, or integrated into a full-scale treatment program. Settlement clarification is the best process for removing coarse, heavy contaminants from water. Ecologix clarifiers include an integrated rapid mix tank and floc tank. As water enters the tank, mixers agitate chemicals into the solution and create large agglomerations of solids. Water then flows up through inclined parallel plates. As the solids make contact with the plates, they settle downward into the sludge hopper for removal. The treated water is drawn off the top of the vessel for discharge or transfer to the next process. This 200gpm incline plate clarifier system (LC-200) installed at Dow Chemicals in Mississippi includes a flow equalization tank, integrated chemical reaction tanks, effluent holding tank, pumps, controls, and mezzanine for maintenance access. TC-Series clarifiers utilize multiple tubular channels sloped at an angle of 60° to form a very large settling area. The shallow settling depth of the design increases settling efficiency and allows for higher flow rates. 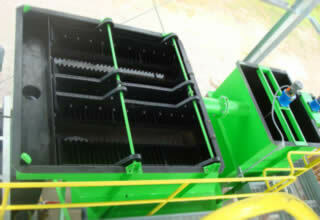 When the tube channels accumulate compacted sludge, the solids slide downward into the hopper bottom for removal. 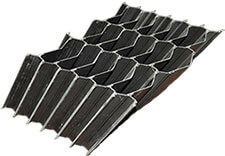 Ecologix’s unique clarifier design utilizes tubes in place of plates to achieve greater surface area in a dramatically reduced footprint.